(Trent Nelson | Tribune file photo) Sean Reyes speaks during his debate with Charles Stormont, as the Utah Attorney General hopefuls meet at KBYU Studios in Provo, Wednesday, Oct. 1, 2014. Utah Attorney General Sean Reyes had a choice to make: Should he join then-Oklahoma Attorney General Scott Pruitt in fighting an investigation by the Environmental Protection Agency into fracking’s effect on water quality in the Sooner State or not? It was May 2014 and signing on would put the then-new Utah A.G. at odds with heads of two of the agencies he was supposed to represent, the Utah Division of Water Quality and Department of Environmental Quality, who saw no value in wading into the issue. Bridget Romano, Reyes’ solicitor general at the time, said the letter was “political, plain and simple,” and passed along the concerns of state agency heads. 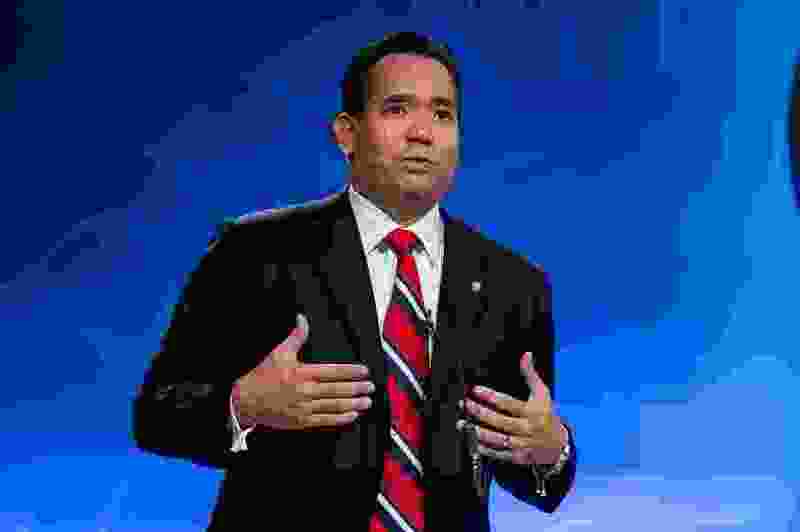 It was one of several times that Reyes had to decide whether to join his fellow Republican attorneys general in fighting politically charged issues either in the public eye or the courtroom. There were challenges to Colorado’s laws on gun background checks and limits on gun magazine capacity and fights against EPA ozone regulations and other regulations on the energy industry. In several cases, a batch of emails provided to The Salt Lake Tribune shows, Reyes sided with his GOP cohorts who were fighting the environmental regulations that big campaign donors often loathed. Pruitt, whom President Donald Trump named as EPA director in 2016, believed the agency’s Office of Inspector General (OIG) was stepping on states’ rights and would duplicate other studies into water quality and hydraulic fracturing, a productive method of oil mining. The Oklahoma A.G. said the OIG should “focus your efforts instead on ferreting out fraud, waste, and abuse,” according to a May 9, 2014, draft of the letter. Pruitt wrote a letter on his own and released it. But the political arm of the Republican Attorneys General Association (RAGA), a group that works to elect Republicans who will fight for small government “and the preservation of conservative values,” believed it would be more powerful if the letter came from a bloc of Republicans. The fracking letter was shipped to GOP attorneys general by the Rule of Law Defense Fund (RLDF), a public policy arm of RAGA. Reyes is the RLDF chairman. Reyes wanted to keep his involvement in the letter quiet, but he also wanted to check with the agency directors in Utah who would have interest in the fracking issue. Walt Baker at the Division of Water Quality and Amanda Smith at the Department of Environmental Quality were “each asking why the AGs would object to the EPA conducting an investigation respecting an area under its purview,” according to an email Romano sent to Reyes’ private email. Parker Douglas, Reyes’ former chief federal deputy and general counsel, worked into the evening on the deadline for joining the letter and was back the next morning to get Reyes’ signature onto the letter. Pruitt is now under investigation by the same office that was looking into fracking in his state, over his travel expenses as EPA chief, his discount rental housing arrangement with the wife of an energy industry lobbyist and his around-the-clock security. Some of those energy companies donate to RAGA, which in turn fuels Republican A.G. candidates’ campaigns. RAGA gave Reyes $300,000 for his 2014 and 2016 elections — making it his single largest donor. “It’s a pay-to-play operation,” Pearson said of RAGA. The emails also show oil industry groups would request — and receive — time with the Republican A.G.s at conferences hosted by RAGA to discuss federal regulations. Reyes’ office disputed the notion that energy groups, through the RLDF, had undue influence over the office. Romano, now working in the Salt Lake County district attorney’s office, said it was appropriate that Reyes unilaterally decided whether to join Pruitt’s EPA pushback. She said she advised Reyes that, given she found the Pruitt letter to be “purely political,” it was the A.G.’s call whether he wanted to sign on. Although the subject of the fracking correspondence involved public policy, those and many of the other emails were sent from Reyes’ private email accounts. Reyes’ office denied a records request by the CMD, saying the emails were campaign-related, Pearson said. Yet in another exchange, from October 2015, Reyes lamented that an RLDF representative didn’t give him enough time to decide whether to join Arizona in a fight against a new EPA regulation that aims to cut ozone pollution. Some of the email chains included messages to both private and public accounts. Utah would later join Arizona, Oklahoma and other states in fighting the new ozone rule. The EPA has said seven Utah counties periodically violate the new standards, formally putting the state on notice Tuesday. “We started paying attention to RAGA and RLDF when it became clear that they were playing a major role in organizing energy industry efforts around climate denial and undermining environmental regulations,” Pearson said. The emails provide a glimpse into the framework of the RLDF and RAGA before Trump became president, when the group was confronting policies of the Obama administration. The Tribune requested all email and correspondence among Reyes, his staff and the RLDF between Jan. 1, 2017, and mid-November 2017. Reyes’ staffers said they found none. In another email obtained by Pearson’s group, from 2016, Samantha Dravis with the RLDF (who later joined the EPA) circulated a draft letter that Republican A.G.s would release in response to Democratic attorneys general investigating Exxon Mobil over how it responded after its scientists warned them of the dangers of climate change. The Republicans came to the defense of the company, a RAGA donor, and released the letter in June that year. Thirteen A.G.s signed the letter, including Reyes.